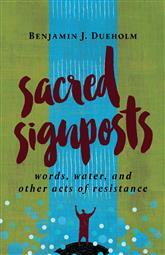 I’m the author of Sacred Signposts: Words, Water, and Other Acts of Resistance, coming out in 2018 from Eerdmans but eminently purchasable right now. I’ve also written extensively on religion, politics, culture, movies, and books for The Christian Century, Aeon, Religion Dispatches, The Atlantic, Pacific Standard, The Washington Monthly, The American Conservative, and a few other places. Ordained in 2009, I’m a Lutheran pastor currently serving Messiah Lutheran Church in Wauconda, Illinois. I previously served in different capacities in churches in and around Chicago. I’m a graduate of the University of Chicago and Deep Springs College. My wife and I have three kids and host an occasional cast of foster children.